A Bonfire of the Economic Models? Customer Loyalty a Bad Thing? What Good are Mashups Anyway? Noting the work of Peter Gloor at MIT. In particular he studies innovation networks-- the ecosystem of innovation, learning, and collaborative knowledge networks through which innovative ideas disseminate. Via Kate Niederhoffer. A simple online data visualization tool called Chartle as a Web application in early Beta that is looking for testers. You can create, embed and share results as you like. All the basic kinds of charts, so if you are not too choosy should work well. Also some simple geo charting capability and animation. Data limitations are unclear, seems to be no data import. Of course similar to abilities available in spreadsheets. Via our always alert colleague Wim Van de Velde.
' .. On the average Web page, users have time to read at most 28% of the words during an average visit; 20% is more likely. We've known since our first studies of how users read on the Web that they typically don't read very much. Scanning text is an extremely common behavior for higher-literacy users; our recent eyetracking studies further validate this finding ... '. Is it because there is too much information instantly available now? I scan books sometimes but it is usually because I am looking for something specific. I scan the Web because I am looking for something interesting ... then it is off on another link. The article has some interesting links on the subject, but you have probably stopped reading this by now. Google is attempting to re-invent e-mail. This is a good overview article. In Gmail they have been adding little pieces of functionality, with varying levels of success, for years. Google Wave is an attempt to do all of this at once. ' ... an integrated communications platform that brings together email, chat, photo-sharing, and collaborative editing features. Google describes a 'wave' as "equal parts conversation and document" and the Wave team basically sees it as a replacement for email and other collaboration tools ... ' . I do like movements forward, but it is always hard to change an infrastructure that is so fundamental to our day to day communications. The Google Wave site. To be introduced 'later this year'. I was late in discovering this, but former P&G CMO Jim Stengel has a web site which promotes his ideas and forthcoming book. ' ... This website captures the journey to rethink marketing, branding and life. It will be dynamic, and I hope inspirational to you. I believe marketing must rethink its purpose. It needs to reorient around making a difference in people’s lives. We must apply life’s lessons (generosity, love, humor, empathy, service) to marketing, so that marketing inspires people’s lives and life inspires marketing. Especially now—it is the way brands thrive in these difficult times ..'. Have just become involved in the early setup days of another start up. A virtual start up where many folks will be widely distributed and often traveling. The discussions of what software and services to use are interesting. There are so many free solutions available today that it is hard to make a choice. Are for pay solutions always better? Compare Google Voice with other phone setups for a considerable fee. More useful thoughts on the topic. Examining WolframAlpha's terms of service. Its a computational service, not a search engine. So the implications for use are different. In 1997 Pete Blackshaw (Now exec VP at Nielsen) created an internship program call FAST at P&G which provided a means for interns to communicate directly with top executives about the company's strategic needs. At that time there was a considerable interest in the emergence of the Internet. I acted as a technology consultant to the program. An article at AdAge talks about the program and how social media have crept into the idea with the obvious concerns about knowledge that is shared there. For background, here is the public P&G FAST Intern site. Former compatriot and correspondent, now co-entrepreneur and my small business consultant, Stan Dyck now has a blog. He is a very good researcher and writer. In his first post he tells us about himself, why he decided to leave the big soap company (Procter) and his decision to blog. ' .. focused on translating my competitive intelligence and business analysis background into opportunities to help local small-large organizations be more successful both pro-bono and on a paid basis ...' . I am sure we will see many more interesting things from him. I will point to them as I can. Pamela Slim writes about Marketing for Nice People. ' ... it is incredibly difficult to strike a perfect balance between sharing information openly, without a tremendous amount of hype, and at the same time, using ethical means of persuasion that help people make a decision to buy ... '. And still reading Slim's excellent book on entrepreneurism: Escape from Cubicle Nation. Worked with a number of Procter CIOs. It is a near tradition that they make the Informationweek top 50 list. Filippo Passerini is the latest, having now been at P&G for five years. Besides the usual issues of dealing with big company IT complexity: ' ... P&G recently launched what it calls "Employee of the Future." Employees each get an IT budget to spend on any equipment they want, rather than relying on company equipment that might cost P&G more to buy and manage ... ' . The article hints at a number of other interesting leading edge tech ideas under way. Intriguing article about Microsoft's new search engine, provisionally called 'Bing'. Have not seen it or tried it. Regardless if it is better, they believe that Microsoft cannot beat Google by producing a better search, but have to beat Google by better branding. Wow, what a self-serving conclusion, keep the ad money coming! They say that consumers don't think that current search is poor, because they have never seen anything better. You could very well say that current search does not work very well. It typically produces lots of wrong answers that we, the users, have to sort out to make it useful. Yes, we have become used to that. That does not mean that we should not search for better solutions and just hope for better marketing. Makes my scientific mind crawl. He describes this technology as being on the downslope of a hype cycle, which is sometimes the best phase to get useful things done. The idea of a Metaverse was derived from Neal Stephenson's novel: Snow Crash. Talk at Case Western by John Holland on Complex Adaptive Systems / Agent Models from this past October. Good overview for the general modeling and simulation practitioner. Have been involved in a number of applications of this approach in the enterprise. Via David E. Goldberg. When I give talks on the Web I often include the caution that you should write knowing that what you say there is permanent and often easily findable. So think about how your future professional prospects will be influenced. As more periodicals are being digitized and placed online it is not only what you write that can easily be found, as this recent legal case shows. I have been long involved with the exploration of RFID tags in retail. Now NEC is indicating that they have developed the long desired passive RFID tags that could cost about one US penny in volume. Of course the cost of an individual tag, say placed on a package is not the only indicator of a breakthrough in tagging. Required infrastructure, integration into packaging, software that generates clear benefit for tagging are all needed to ultimately produce a breakthrough. From Storefrontbacktalk: Twitter-Only Shopping Site Gets $4.7 Million Investment. Evan Schuman provides some interesting views of the funding of the idea." ... A site has launched providing human-assisted shopping integrated with a Twitter shopper site. That’s not that unusual as the Twitter world is filled with them... "
Justin Lindsey, CTO, Netezza, Named 2009 CIO Innovation Award Winner at 6th MIT Sloan CIO Symposium. A Fortune piece on P&G's leadership strategy. How will this assure effective transition of leadership?
' ... What makes Lafley so confident is a rigorous leadership program called Build From Within. It microscopically tracks the performance of every manager, making sure that he is ready for the next slot. At P&G, says Lafley, each of the top 50 jobs already has three replacement candidates lined up ... '. I lived through this 'promotion from within' approach for many years. It is remarkable that with only minor adjustments, it has lasted so long. Good piece from IEEE Computer that looks at the concept of discovery systems. This type of AI system constructs hypotheses from raw data presented and then continues to update its conclusions from new information provided. Very similar in concept to the way people acquire knowledge and then adapt it to new circumstances. We experimented with such learning approaches in the enterprise with some success. 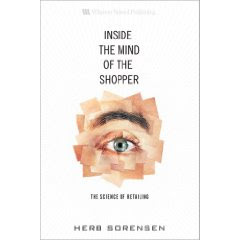 Herb Sorensen book is now out Inside the Mind of the Shopper: The Science of Retailing, from Wharton School Publishing. It details some of his work exploring how the shopper behaves in their environment. Based on extensive databases of how shoppers move, shop and buy in the store. We had many fruitful conversations with Herb that led to improvements in our innovation spaces. Wish we could have collaborated more. Includes descriptions of collaboration with Peter Fader at the Wharton school, Wendy Moe of the University of MD and work by Mike Twitty at Unilever and Bill Bean at Pepsi and Colgate. Glad to see that P&G provided some of the earliest inspiration for Sorensen's work. He describes some of those experiences with Bob Stevens of P&G. The book covers many classic issues based on quantitative results: the nature of the trip ... what do they buy ... why is money left in the aisle ... the influence of packaging ... the nature of the engagement and what makes the close. Must reading for marketers and retailers who seek to understand the complexity of retail behavior with real experiments. He treats the operation of retail as a science. I particularly like his Three Currencies of Shopping: Money, Time and Angst. In that short section (p. 62) he quickly brings together the measures that can make or break a shopping experience. Overall the book is an easy read, with lots of useful measures and direction. The book also covers some of the newest advances in merchandising technology such as visual media and cart based displays. I often cover Sorensen's work and writings in this blog. This ReadWrite Web post points to a good TED talk by Tim Berners-Lee and give you an overview of the topic of Linked Data. With the suggestion that this is the next evolution of the Web. The idea is to link together the many ontologies (knowledge structures) that exist on the Web today to make the whole Web more useful. Makes sense. The TED talk is an excellent start to understanding this, plus many more links in the post. A look at Microsoft's retail experience center. Time interview of Martin Lindstrom, who's Buyology book I have mentioned here a number of times. How Shoppers Make Decisions in a Recession, interesting thought, I do clearly remember the 1977 recession, will see how it plays out.
" ... What is fundamentally different about the recession, except for the ones we had in the 1930s, is that we're putting bookmarks in our brains. When icons that we defined as stable, like Lehman Brothers, fall apart, you are suddenly questioning everything around you. So consumers now, if things start to get better, will not run into the stores and start consuming like there had never been a recession. That will not happen. At the end of the day, consumers will want something practical that will enhance their lives in concrete ways ... "
Good CW piece on the subject. Had a recent conservation about this. It has indeed changed our world. We are part of a considerable social experiment about information, privacy, attention and economics. We can know more now but its implications are still unclear. At an alumni event yesterday I attended a talk by Prof's Peter Fader and Eric Bradlow on Wharton's Interactive Marketing Initiative (WIMI). Disappointed that I had missed the formation of this group, seems that they have lots of analytically interesting research going on with interactive systems. See the link for more news. Will follow their work from now on. They are also on Facebook. Googles new squared service seems to be a tongue-in-cheek response to WolframAlpha. Give it a try. Manipulating numbers. I do like Google's sometimes absurd direction. Good short piece on private label 'protection' implications in retail from Nielsen. These look reasonable, likely 2007 or 2008 data. Also the total, max and min of the set are shown. I could have seen other data compared here, say GDP as well. The result gives you the chance to find the source of data, which are 'WolframAlpha curated'. They give you a number of possible answers, not the exact source in this case. Not completely satisfying. Note that my question is database-like. No attempt to be English. So if I change the query to: 'Cellphones in use in ....' or any other attempts to make this a full English sentence, WolframAlpha does not understand. It also does not understand when I substitute 'laptops' for 'cellphones'. The latter appears to be a data problem. So the experience that many people will get if they try to use some form of natural language, as claimed, may be less that satisfying. I did get my answer. You can now publish your blog for pay on the Kindle. More details on the Beta here. And more commentary on the idea. Excellent piece in Communities Dominate Brands on The 8 C's of Cellphones. The 8 C's the different dimensions of mobile and how they have evolved. In Fast Company. Or really its about constructing a space. 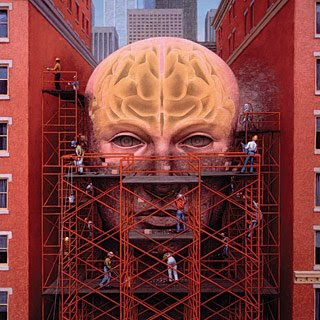 A genius loci or spirit-of-the-place that influences us. Yes, it is different when one walks down a busy street vs a woodland glade. Salk believed that the architecture of the place had influenced his mind. Mentioned is the Academy of Neuroscience for Architecture in San Diego. Also mentions a SciAm article on room design and creativity. Of course this influences us while we are being creative. It also influences our clients in understanding our work and the customers who will ultimately interact with our designs. I sit in a building with cathedral ceilings with the sun streaming in and I do feel and expansion of creativity. In the enterprise we explored the influence of shopping context design ... how aisles, lighting, fixtures, packaging could help determine the moment of truth engagement and results. The invisibility cloak idea is an interesting physics concept that bends light around an object and thus making it effectively 'invisible'. Well known in fiction of course. A new variant of the idea described in Technology Review allows one object to look like another. It makes the imagination run riot, but none of these ideas are yet practical in any full-scale way. Off the top of my head, you could redesign portions of a retail space without really moving anything. Be patient for this one. Why did most academic economists fail to see the sharp downturn coming? In Knowledge@Wharton: Why Economists Failed to Predict the Financial Crisis?. This presents an overview of what modelers considered when trying to understand the economy. From my perspective ... either a model is incorrect in describing the first principle operations of the economy. Or there are aspects of the economy that were not included in the model to begin with. Note that the second case is just a form of the first. Again, check out game developer/modeler Ken Karakotsios economic modeling example. Consumer Goods Technology reports that BusinessWeek includes Procter & Gamble and Coke to be among the 50 most innovative companies. Proud to have been a small part of that work. Bit out of the normal realm of my posts, but my astrophysics background makes it a requirement, have followed Hubble space telescope for many years. Followable now on NASA TV. Still amazing stuff. Have always enjoyed Evan Schuman's blog on retail topics, and have learned much from it. He is now addressing a common problem of any long running blog that covers the details. How do you provide access to all the background information generated? More on what they are doing here. Check out their new research site: StoreFrontBackground. Registration required. ... Topics: Network Infrastructure Stock exchange NYSE Euronext is deploying a 100Gbps network from Ciena as part of its plans to improve bandwidth tenfold and reduce latency in financial transactions. It hopes the increase in speed and reduction in the time taken for transaction processing the network promises to provide will enable it to take more business from competitors. The network will play a key role in NYSE Euronext's communications backbone - the Secure Financial Transaction Infrastructure (SFTI) network, which aims to give the exchange's customers' access to a variety of financial services. I mentioned that the CACM has a launched a new home page, to which I am contributing. I see that the IEEE Computer Society now also has a new main page. Has a news feed and podcasts, but no blogs. IEEE seems to be doing more with social networking connections. Overall well done, anyone with an interest in computer science developments should subscribe. It is also the IEEE's 125th anniversary. Jonah Bloom on public relations and 'earned media'. Includes a number of principles that are well worth considering. ATLANTA, GA – May 7, 2009 – Dave Katz, Client Partner/President of ClientOne today unveiled Shopper Marketing 2.0 the Shopper Marketing Lab (SML) at the 2nd PMA Shopper Marketing Summit. SML is a comprehensive analysis framework that’s sure to be a catalyst for change in CPG/Retail go-to-market strategy. Armed with a belief how shoppers behave informs what business should do with their marketing dollars SML phase I measures incremental contribution of layered marketing influences on the shopper path to purchase. With two key differences, the analysis anchors in a revolutionary 360° understanding of Shopper households.
" ... a business analytics search tool called SAP BusinessObjects Explorer that Apotheker likened to an "iTunes" for business analytics that allows any business user to search and find business analytics information very quickly, he said. ... It might be tempting to pamper longtime customers with special perks, but is it really profitable? Loyal customers aren't profitable and most profitable customers aren't loyal, two marketing experts point out. A business is better off looking at who's actually buying the most and catering to them ... "
Recently I took a look at Sears new IPhone application. Not very exciting, but it works well. They are continuing with a social networking called MySears. The tagline is: Get advice before you buy. Includes reviews and discussions of the usual sort. Review section seems to be very frank. An ideas section and a number of polls. I thought that their Guides section was most interesting, since it addresses some of the typical questions new householders have. KMart has a similar site. They also have a Twitter site @mysears. Also linking to many social networks. Overall has to be a good step in modernizing the Sears brand. And another review. Technology simplifies tasks, but complicates lives. Good reminder, we need it. O'Reilly on asymmetric following. This is an aspect of social media I had been thinking about since being introduced to them. He has some excellent points here. Complete symmetry is unscalable. You cannot effectively experience it all. Very selective interaction is key. Yet the promoters of these systems use numeric counts of friends and followers to drive their use and lead to their marketable models. Now that I am using systems like Google Voice I thought about the ultimate demise of voice mail. Yet that system does not always provide a good transcription of the audio, and there always has to be some sort of backup. And to suggest that social networking like Twitter could replace voice broadly is much premature. There is still something about the warmth of voice, even recorded, that will be hard to replace. Yesterday I finally got early access to WolframAlpha. I understand it will be coming out publicly in the coming week(s). It is being positioned as '... Making the world's knowledge computable ... '. I have also seen two demonstrations by Steve Wolfram and listened in on question sessions. The interface is very simple. You type in English (only for now) questions. There are also a large selection of good examples you can experience. 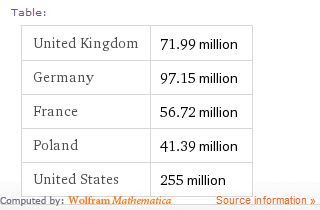 They are also careful to point out that ' ... Wolfram|Alpha is an ambitious long-term project to make all systematic knowledge immediately computable to anyone ... '. Have seen much gushing over the emergence of this package. I applaud the effort, it is a great idea. I also point out that the package is in a very early phase of what they correctly say is a long term effort. I have tested it so far in the domains of food, math, physics, chemistry and economics. As might be expected, it does best in math. First of all, in all of my experiments I have yet to see it do any real natural language. Language is hard, often ambiguous, so I understand that they have not solved the natural language problem. Yet even relatively simple fairly unambiguous statements like 'Plot US Deficit by Year from 1990 to 2000' cannot be interpreted. Lots of similar examples. It understands something like: Atomic weight of O to be a physics question and answers it. It does not understand: Atomic weight of O plus the atomic weight of H, which is a (very) simple language/arithmetic addition to the physics. Adding more language does not help. Forget subtlety. When confronted with this kind of behavior you tend to simplify the language, which also does not help. It does not seem to 'understand' the language at all. Note the comparison to search. Google understands 'How many quarts in a peck' (as does WA) but not because it has solved the deeper language problem, but because it does simple pattern recognition. We have become accustomed to the inaccuracy of search results and adjust our expectations accordingly. WA is different because the interpretation of the language and the search will be used to drive numerical computation. We expect a search to give at least some reasonable results, and we can sort out any ambiguities. WA may often provide nothing at all. Also, haveing been involved with this kinds of effort before, this is not something you can simply patch. You either have some reasonable underlying language understanding model, or you don't. I repeat, I applaud this effort .. it is a great idea. The examples shown are intriguing, excellent and well thought out. They show the ultimate scope of knowledge being addressed. I am afraid though that what is being being delivered as a 'long term effort' is very premature. I understand the pressure to deliver this kind of thing once revealed. Worried about the reaction by the general public to discount it as a competitor to search engines. I continue to experiment with it. Update: The NYT on WolframAlpha.
" ... Two companies, Basisnote and Scientific Match, are developing technology to match couples based on the genetic components of the human immune system -- and their odor. Studies have linked odor to immune systems and shown that people are most likely to be attracted to the smells of those who have different histocompatibility genes than their own. While those who have similar immune systems tend to not be attracted to each others' odors ... "
In the Atlantic: Shoppers need Deadlines too, on promotions and gift-cards and related research. Karel Vredenburg of IBM provides a good adult overview of Twitter behavior. What it is, how people are using it, and what they think about it. He got most of these insights by running surveys on Twitter. These are interesting if you are planning to market or promote using this tool. 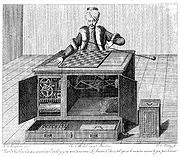 After hearing little from Amazon's Mechanical Turk system for some time, I just received a note that they were establishing a resource center. This is an attempt to connect human and machine intelligence which I always thought was not considered enough.
" ... The new Resource Center includes sample use cases and customer interviews demonstrating how businesses are using Amazon Mechanical Turk for a wide variety of work including web site moderation, data governance, metadata creation and more. The Resource Center also includes a Best Practices Guide to help you optimize your approach and get the best results with Mechanical Turk.... "
The Mechanical Turk service, connects problems with humans to solve tasks that can only be done by humans. They call the tasks HIT's or human intelligence tasks. An intelligence marketplace. I have seen no stats from them recently, and it seemed that the service was faltering. So this is a good next step to help simplify its use. Microsoft's presentation on the use of Business Process Management in retail. Well done. BPM should be used much more than it is. It is the simplest form of 'expert system' for typical processes. It it can be difficult to automate some processes unless properly positioned. Teller on the Neuroscience of illusion in Wired. There is something to learn here for the merchandising arts. " .. exploiting gaps in human perception ... " . Via Richard James. A NYT piece on the science of concentration says that focus, once broken, can take twenty minutes to re-establish. Overviews some of the findings in the book Rapt, by Winifred Gallagher. As new social services bloom, our online world continues to fragment our attention and moving it from focus to focus may be more difficult than we had thought. In the store, how we interact with shelf facings and their increasingly complex 'interface', laced with colors and interactive screens, may also be at risk. Experiments with advanced packaging and mobile devices that extend that packaging and cart devices that seek to engage the shopper need to be thought through carefully. While eyetracking can be utilized to address these issues, it is not often used in sufficiently long time-contexts to understand aspects of sustained focus. Much room for new understanding here. It has been reported that ExxonMobil has released a new station locator using the Google API. It has also been pointed out that the service does not have a form designed for mobile use. Makes sense, but a quick search of applications for common devices shows none. A link to presentations from the New Communications Forum meetings. About social media and their implications. Jonathan Salem Baskin writes about digital data and having a clear vision about how the data is ultimately used. It is about the data, but it is also about the model it is being used for " ... challenge your team to better understand the real-world actions that truly matter to your business, along with the, yes, qualitative levers that enable them. Decide to deliver and measure the actions that make sense, instead of changing your definitions and expectations to make sense out of what matters to the campaign (or flashes brightest on your dashboard) ... " . Also read the comments. An article just pointed out to me from Consumer Goods Digital: The Digital Advantage. Good overview piece on using data for category management. Specifically a case study is made of the Dr. Pepper Snapple Group. Namely a discussion of common pitfalls in category management strategy that I thought were useful. A short piece in the Washington Post on the use of scanning devices at Giant grocery stores. " ... A total of 250 Giant and Stop & Shop locations carry the scanners, the company said. Giant said it conducts regular audits to help prevent shoplifting and fraud ...... ". They see this as an extension of the use of automated checkouts, taking the process into the aisles. Although I have always been skeptical of 'best' lists of any kind, a new list mentions a number of companies that I have had minimal and extensive experience with on a 'most reputable' list. At least it makes people think about the measures involved. Yet context is often the biggest player. A big coffee launch is coming at McDonalds. " ... The master of the McBlitz is about to outdo itself with its long-awaited national campaign for its new coffee line, touted as the biggest launch in its history -- no small feat for a company that regularly drenches consumers in marketing.... " . Makes much sense for them. A good overview of business analytics and optimization for the enterprise by IBM. Helps to understand their definition of this space. Well done. A Harvard Business conversation starter piece: How P&G and Google approach new customers. Also includes some useful comments on the topic. The obvious is stated: proactively understanding your customers before expanding to new markets. Interesting piece on the nature of mashups. Oddly I have seen less about the idea of late, but think its a good concept. " ... A new breed of Web-based data integration applications is laying its foundation across the Internet. Collectively called mashups, their popularity stems from the emphasis on interactive user participation and the manner in which they aggregate and stitch together third-party data. Very much a product of the Web 2.0 movement, the “foundation” metaphor is a reasonable one; a mashup is characterized by the way in which it draws content and functionality from disconnected data sources outside its own boundaries ... "
When I first read this piece I was confused. Is a visual representation of a person OK to represent a company? I had read Byron Reeves: Media Equation .... which seemed to say that people are more likely to respond honestly to avatars than they are to real people. Is this also the case with the representation of enterprises in an avatar logo? Especially if we want to have a conversation with that company? The post makes some interesting points about that. Thoughts? CapGemini recording on the value of BI in infrastructure business downturns. Notable mentions of operational optimization using BI and allied analytical methods. By Stephen D. Harris. I have reported on this a number of times during its test, but now The Communications of the ACM has formally launched their new web site. The Press release here. Includes a number of new venues and blogs, including this one, to report on research and emerging ideas. Check it out and pass this on to your social networks, as I will. The latest Wolfram blog post is Twittering with Mathematica. Would you have expected a mathematics and visualization package to be able to interact with the API's of a social media package? A large set of case studies about how to do it. Nicely done. Hints to how WolframAlpha was done.
" ... The ability to analyze Twitter data and to tweet programmatically opens the door to many interesting possibilities. Imagine running a long computation that notifies you via Twitter when it finishes. Imagine finding new friends by programmatically determining friends of friends or friends of friends of friends. Want more followers? Perhaps you could analyze the Twittering habits of popular users to see what might make them so popular. The possibilities are endless, as they usually are with data explorations in Mathematica ... "